October, November and December, Tritonal and Super8 & Tab will embark on a joint North American tour, hitting up cities like New York, Denver, Los Angeles, Seattle, San Diego and many more. The tour's name, ARC, is also the title of the upcoming track Tritonal and Super8 & Tab will soon release together and highlights the energy the groups plan to unleash from coast to coast. By playing in the intimate nightclub setting, fans will get to witness extended sets from the duos and hear classic Super8 & Tab tracks such as 'Helsinki Scorchin,' 'Black Is Back,' and Tritonal's 'Still With Me,' and Lifted,' - not to mention the remixes the guys produced for each other, like 'Awakenings' and 'Piercing Quiet.' While in Ibiza to play ASOT Invasion at Privilege on September 10, the guys put together the below teaser video to talk about the tour. Check out some footage from that night and hear a preview of their collaboration 'ARC.' 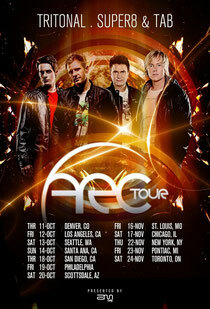 The ARC Tour kicks off on October 11 at Beta Nightclub in Denver, CO.